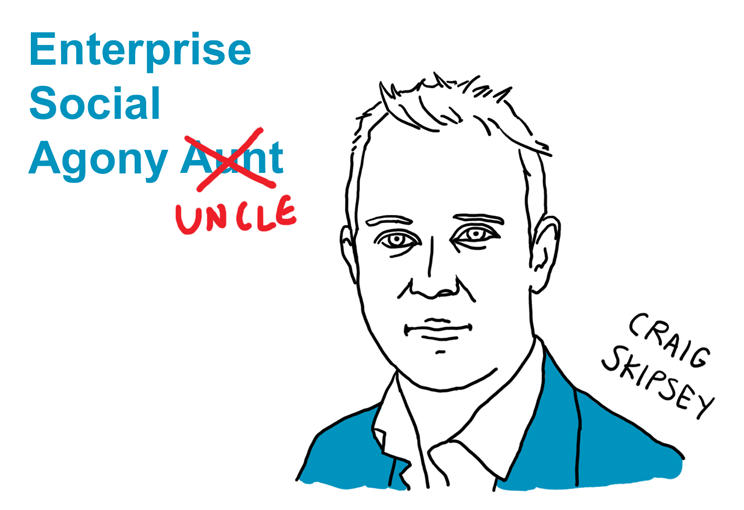 I often ask people what they are struggling with in the enterprise social space. Rather to pretend that I know all the answers I thought I’d outsource some of the questions to my network of enterprise social experts in the form of Agony Aunt posts (why not!). The first agony aunt/uncle is Craig Skipsey. He comes from a management background in the construction industry and now runs his own enterprise social consultancy Enterprise Social near Melbourne area, Australia. Craig Skipsey: Talk their language. Elevate the discussion by talking about business strategy and objectives, not technology. Ask how the company measures business objectives. In response they’ll probably discuss lagging metrics or short term goals like revenue, EBIT, working capital etc. However, lagging metrics just tell you what has happened after the fact. When do you know a strategy has failed? Usually not until it’s too late. So here is the pitch: Human behaviour is the ultimate leading metric. An enterprise social network, when deployed and used well, provides an ability to influence and measure human behaviour. You could also try to create urgency by hypothesizing about what it would be like for your competitors to develop this capability before you do. The strategy – behaviour – Enterprise social network is the critical link you need to explain to the C-suite. But again I stress its about business not technology. Do you have a question you want an expert to answer? Or do you want to be an Agony Aunt/Uncle? Email me at virpi(at)businessgoessocial.net or tweet me @voinonen. Executives often don’t know what the reality is on the ground. They might think that everything works perfectly. So what you can do is to collect couple of stories that highlight the problems in collaboration and information flow and contrast them with the lofty goals (“providing a streamlined user experience” or whatever the goals in this particular organisation are). And if you can, calculate how much this state of affairs is costing the organisation.